Beginning at 11am on Sunday, children in grades 1-5 will meet for games, music, and Bible lessons. Their classroom is in the lower level of the education wing. Signs show the way. GraceCompany Worshippers continue to meet during the worship time at 9:30am. Children, ages 5-10, meet during the last half of GracePoint Worship to pray, learn scripture, experience/learn about worship, and have fun! 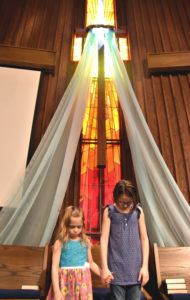 A leader and helper will guide children from the sanctuary to the GraceCompany Worship Room near the sanctuary. If GC Worsippers finish before GP Worship, the children will be in the Fellowship Center waiting for the parent to get them. If GP Worship finishes first, parents may come to the children’s worship room to get them. September 9, 2018, 11 a.m.
Kindergarten – 5th graders, known as GraceCompany, meet for Bible classes in the lower level. Parental sign in and pick up is part of GracePoint’s child safety procedure. Kid-friendly workshops in age-appropriate environments include art, drama, music, games, storytelling, puppets and many other educational media. Bible lessons are taught using different learning methods. Children rotate each week to a new center to deepen their understanding of the story and to apply what is learned. Infants will be lovingly cared for in the Childcare-Infants Room. Preschool children have supervised play in the Childcare-Preschool Room. KIDS ACTIVITY BAGS are available at the sanctuary entrances for young children to use during worship. GracCompany Worshippers, children ages 5-10, may leave the sanctuary before the final Praise Song to experience age-appropriate worship with a leader and helper. See description under Summer Schedule. Remote live worship is available in Common Grounds.